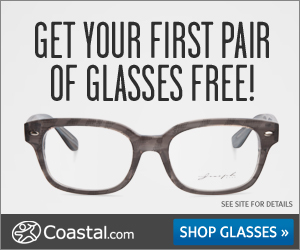 Coastal.com is doing their, "Get your first pair of glasses **FREE!" promo again. Use the code FIRSTPAIRFREE when checking out. *Available for first-time glasses customers only. *Shipping charges of up to $20 apply. Lens upgrades and coatings available at an additional cost. Click on the picture above to visit Coastal.com.